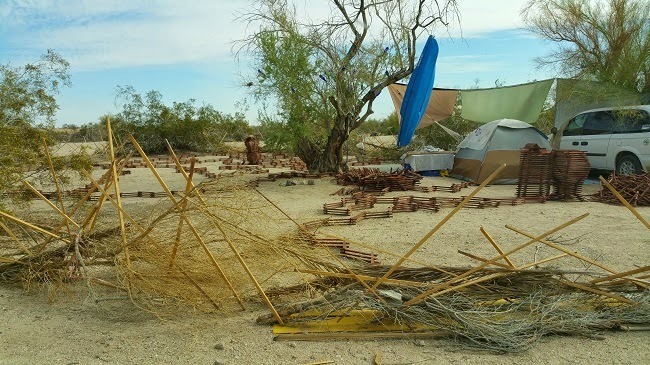 The colorful lump of painted straw and adobe disappeared from my rear view as I drove the bumpy dirt road to Slab City. 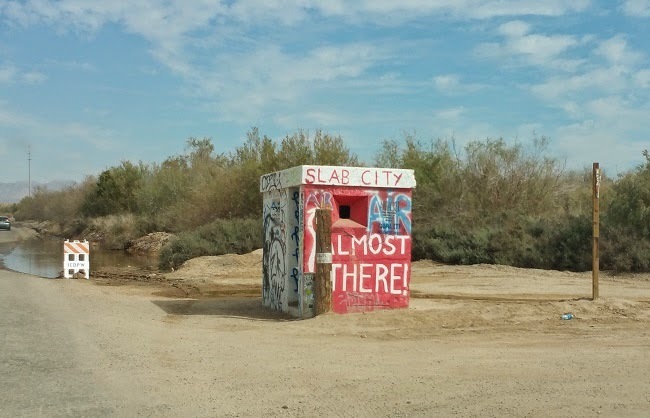 I passed a small concrete structure painted with a cheerful greeting. The little guard station was one of the few remaining relics from Fort Dunlap, a World War II-era Marine training base. 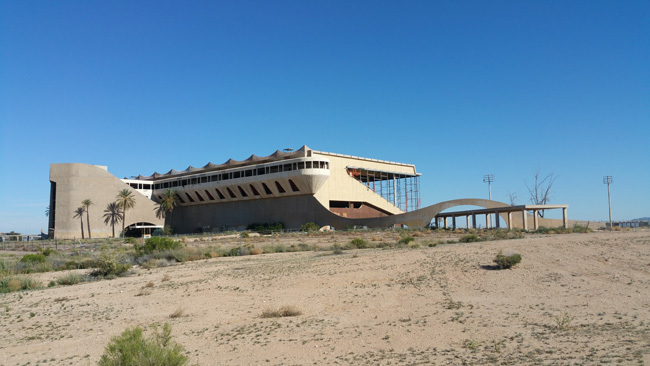 Built in 1942, the base was dismantled in 1956, leaving only the concrete slabs for which Slab City is named. A bulletin board stands along the inroad, crowned by a neat old bike. I was surprised to see how empty the board was. I guess I'd imagined more open invitations for community activities. 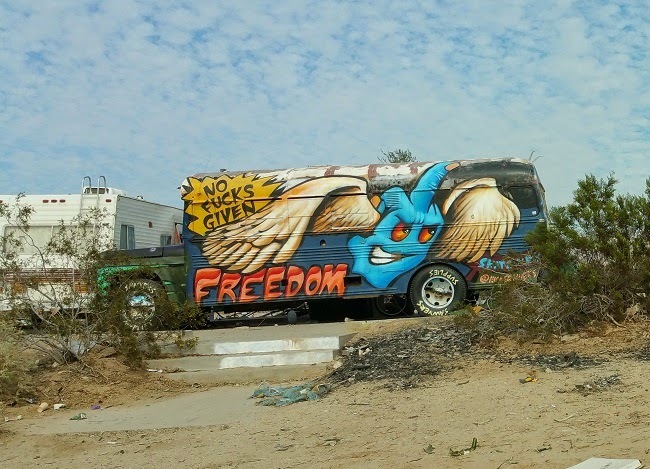 As on Salvation Mountain, Christianity is the only religion that announces itself. 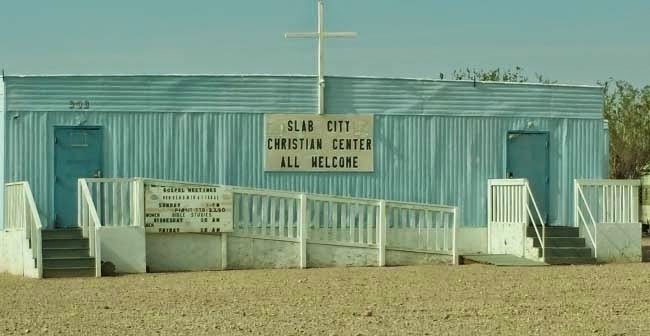 The Christian church stands near the bulletin board, two symbols of community at Slab City's entrance. 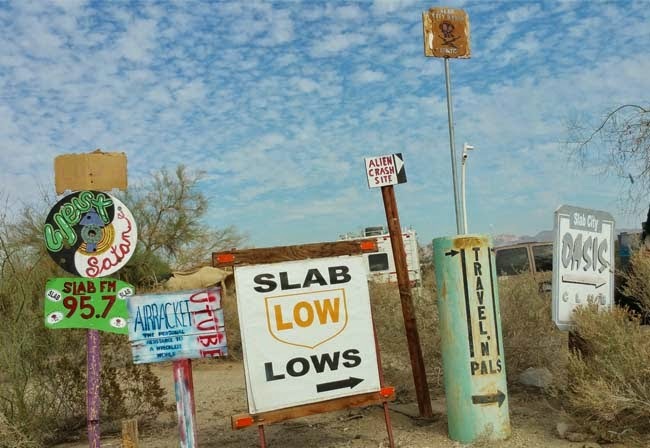 A group of signs along the main road point to some of Slab City's notable locations. 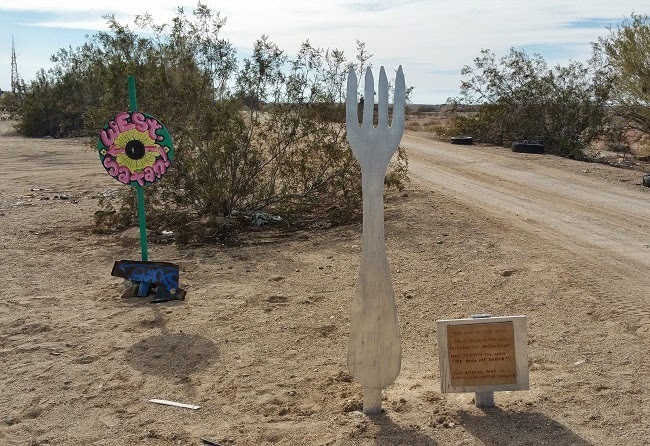 I was intrigued by the alien crash site, wondering if it was some sort of art installation or if someone believed it actually was the site where an extraterrestrial vehicle had crashed. I never managed to find out. 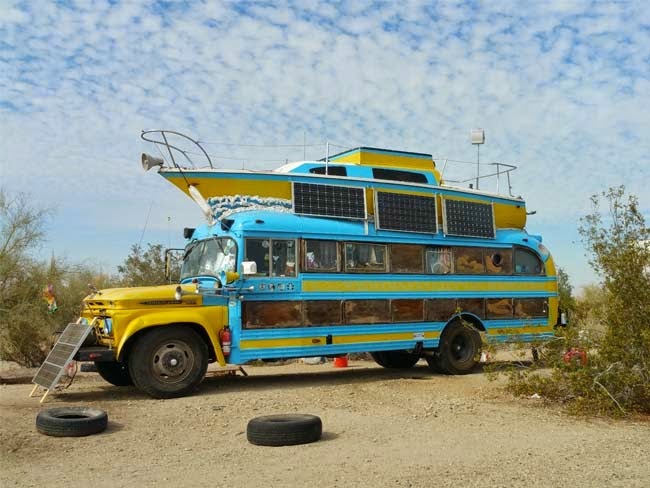 The people of Slab City are incredibly creative. 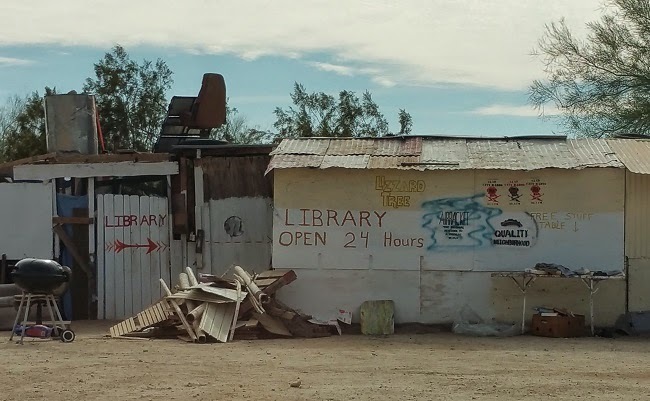 You need only glimpse their homesteads to see it. I wondered if their creative potential only emerged after they disconnected from commercialism and conformity, or if artists' instinct had driven them to seek a more liberating environment. 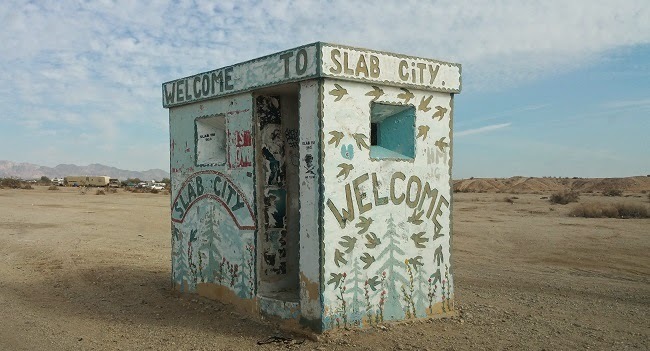 In 1965 people began migrating to Slab City to live off the grid. 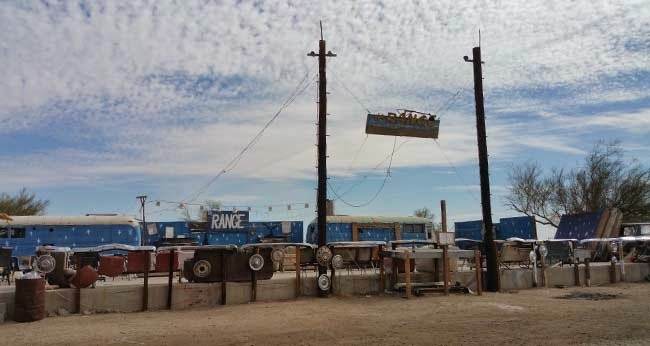 The settlement lacks infrastructure such as electricity, running water, sewers, or trash pickup service, though the residents have found ways to live without them. 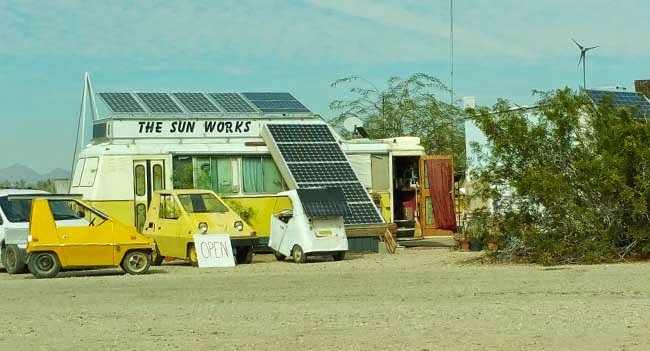 Many homes have generators or solar panels. and even a concert venue. I like to support unique local businesses, so I stopped at the café. It appeared to be little more than a large tent with tables and chairs. I walked around but could find no counter or anyone who seemed to work there. 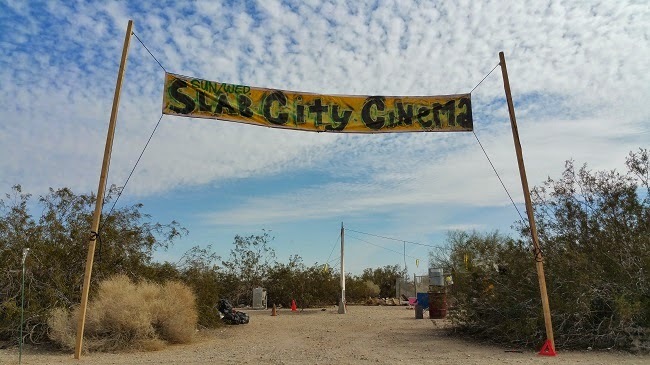 A handful of people sat around a table, engaged in conversation, but I did not approach them because I'd read that Slab City residents are not crazy about outsiders. As I was leaving, a skinny old man with long white hair walked outside and pissed near the wall, not 10 feet from the doorway. 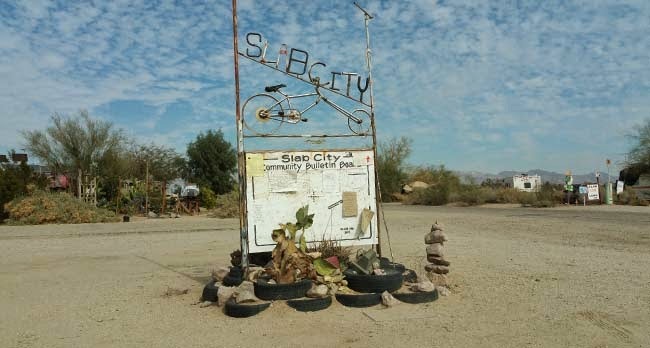 I headed over to East Jesus, a sculpture garden on the outskirts of Slab City. 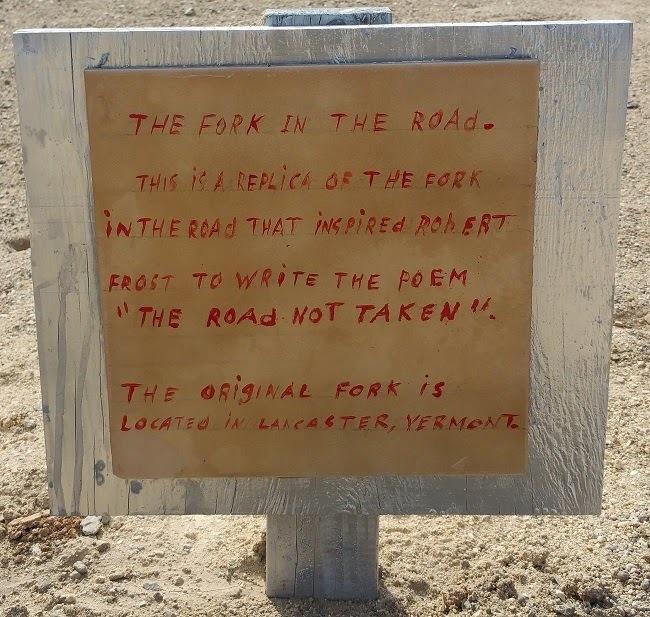 On the way, I came to a fork in the road. Literally. Beside it was a sign for West Satan, the ironically named piece of land next to East Jesus. This place reminds me of something from Fallout. It reminds me of Fallout too! I'm looking forward to playing Fallout 4 when it comes out. Fallout: New Vegas I think. Who owns this land? Who decides who can live there? Population? I believe the land is owned by the federal government. After it was abandoned by the military it remained unguarded, allowing people to move in without resistance. 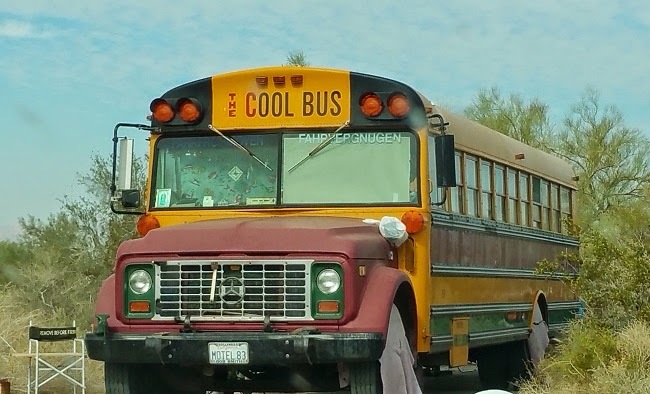 I'm pretty sure it still technically belongs to the government. About 150 people live there year-round, but the population fluctuates dramatically throughout the year, depending on weather conditions. 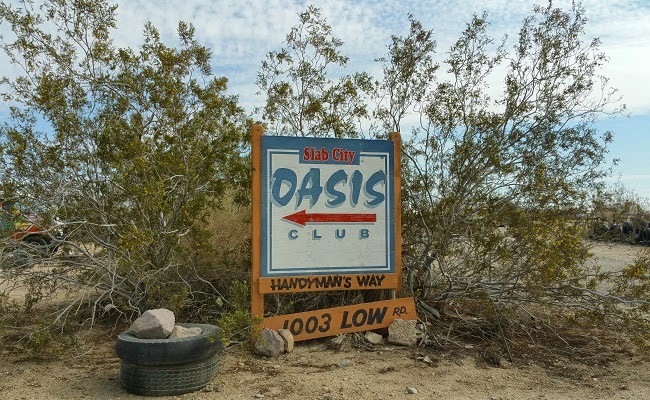 I thought it would be neat to hang out there too, but I've heard they aren't crazy about outsiders coming around. It would be nice to know someone who lives there who wouldn't mind hosting for a night or two.